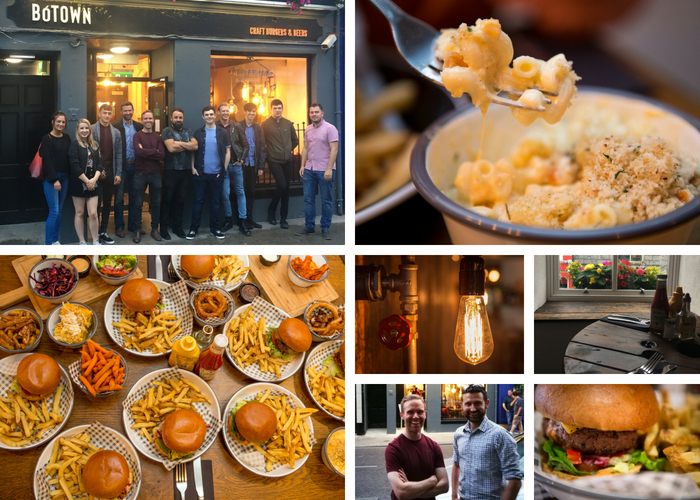 Advertiser.ie - BóTOWN - The city’s newest burger bar! Located in the heart of Galway’s trendy West End, BóTOWN serves up a wide selection of craft burgers and beers across two floors in a really chilled, cosy and charming setting. The city’s newest burger bar might have only opened its doors last month but it has been over two years in the making. It is the creation of local lads David Fitzpatrick and Frank Greaney, who have completely revamped a previously derelict building at 57 Dominick Street Lower. BóTOWN prides itself in its burger and beer offerings but it also has an impressive range of starters, sides, wine and hot drinks. David and Frank’s attention to detail is plain to see in every aspect of the business from the renovation itself to their carefully tailored menu. The interior is a real talking point with gun barrel light fittings, timber cladded walls and authentic red-brick arches. The childhood friends also left no stone unturned in their pursuit of the best locally produced ingredients for their burgers. Quality is paramount. Their beef patties are the perfect blend of three different cuts sourced from McGeough’s farm in Oughterard but there’s more than Bó to BóTOWN with chicken, fish, vegetarian and vegan options also available. Gluten-free beef, buns and beer are also on offer. BóTOWN is open from 1pm to 10pm every day except Saturday when it opens a little earlier (12pm ). Check out their Facebook and Instagram pages for a look at their menus and their incredible journey so far.